Marysia "Mott" swim top in solid-color, textured microfiber. High, round neckline; halter straps tie behind neck. Scalloped edges for feminine appeal. Banded under bust for light support. Fastens with clasp at center back. Marysia "Mott" swim bottom in solid microfiber. Lise Charmel "Ajourage Couture" swim top in solid microfiber. Halter straps ties behind neckline. Laser-cut detail. Triangle cups. Hooks at mid-back. Nylon/spandex. Imported. 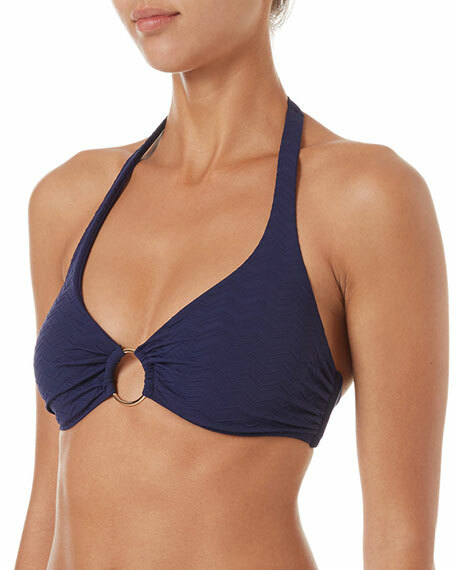 Melissa Odabash "Brussels" swim top in metallic-striped microfiber. Plunging neckline with O-ring center. Halter straps tie behind neck. Suitable for D-G cups; underwire for support. Ties at mid-back. Nylon/polyester/metallic/Lycra spandex. Made in Italy.